With Christmas approaching fast, what do you plan to give to the ex-fundy in your life who has everything? 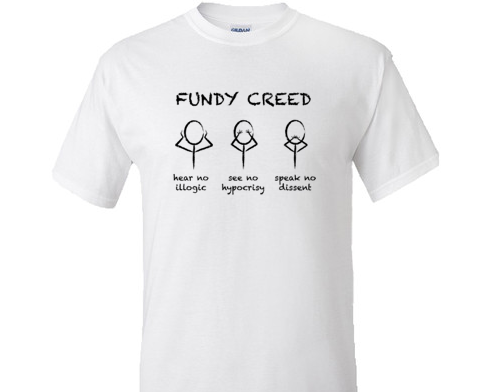 How about a Fundy Creed t-shirt from SFL? Our custom t-shirt friends over at Whooptee.com are offering five SFL readers a shot at winning one of the five available white Fundy Creed t-shirts in the size of your choice (S to XL). Use the Rafflecopter form below to enter. Only the first entry is mandatory to enter but you can also follow and like the various Facebook and Twitter feeds for extra entries. Again I have to apologize to our International friends but due to shipping costs this giveaway is only going to be available for our SFL readers in the USA.This giveaway will run from Saturday 9/29 to and end at 11:59 on Saturday 10/7. The winners will be contacted and will have 48 hours to respond before an alternate winner is chosen. May the odds be ever in your favor!